Here it is- another version of the staple. We were down in Boulder this afternoon, visiting friends and playing Trivial Pursuit (one of our all-time favorite board games). 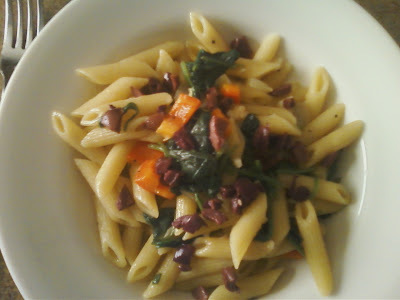 I was tired when we got home and just wanted a quick and simple pasta dish with easy clean-up. For this recipe, feel free to use whatever veggies you have on hand. The olives and balsamic vinegar really do the trick- I didn't have to add any salt or parmesan to this dish to give it that kick I always crave. 1. 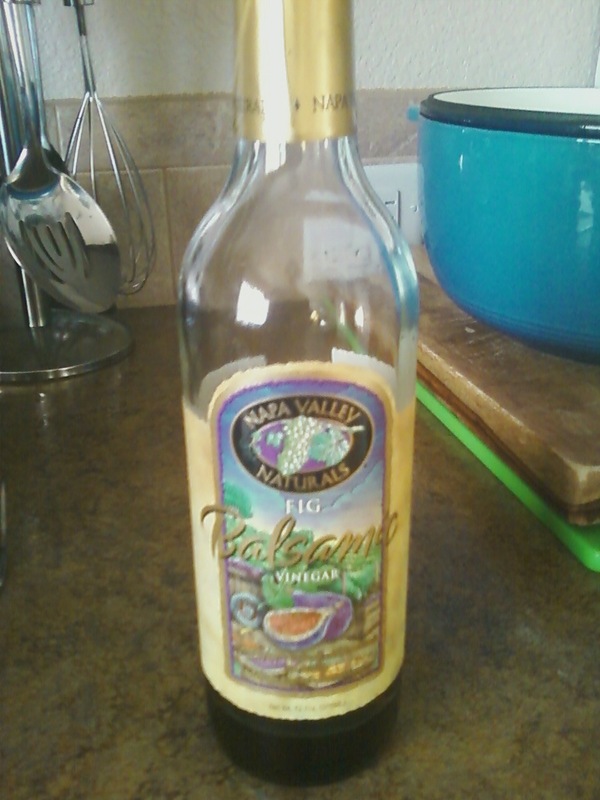 Start the water for the pasta, adding salt. Add the pasta when the water is boiling and cook according to package directions. 2. Meanwhile, heat 1-2 Tbs olive oil in a medium-large pan and add the onions and red peppers. Reserve the garlic. Sauté until they are soft. 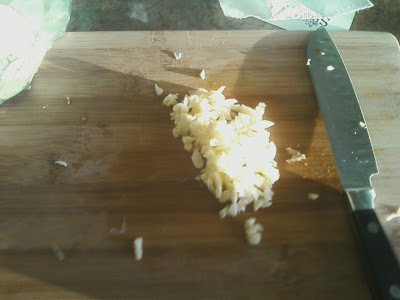 Add the garlic at the very end, sautéing for only a minute or two before removing the pan from the heat. This keeps the yummy garlic flavor potent enough so I can keep the title as "garlicky pasta". 3. 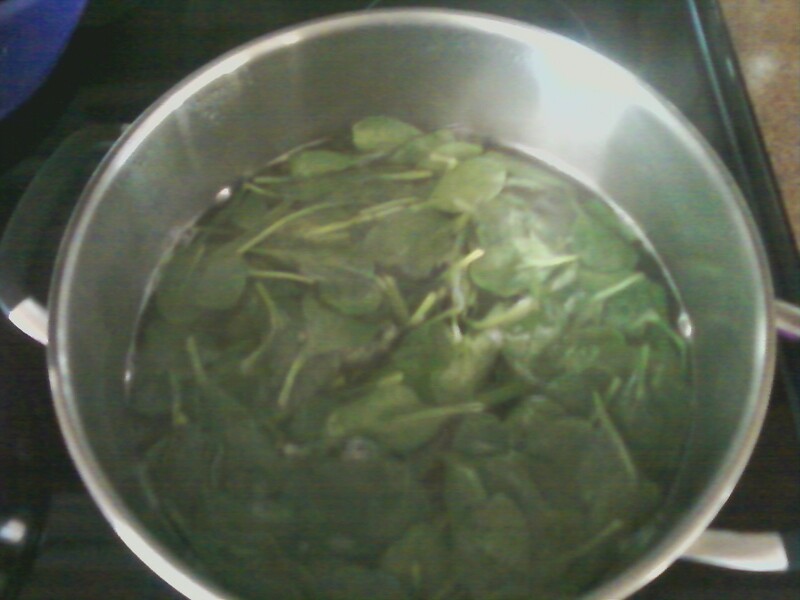 With about 2 minutes left on the pasta, add the spinach into the water. Drain together when the pasta is done, give it a quick rinse with water and place back in the pan. 4. 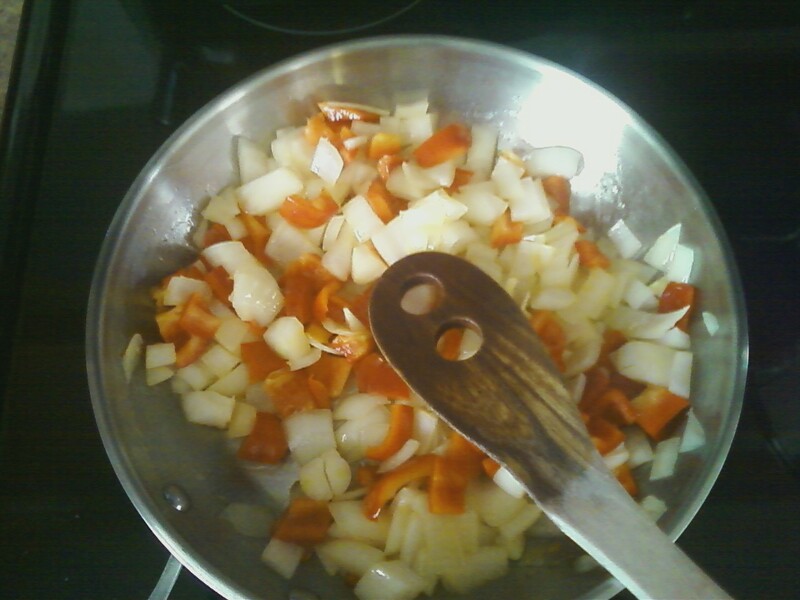 Mix the onion/red pepper/garlic mixture into the spinach/pasta. Add a splash of olive oil, a sprinkle of dried basil and a few splashes of vinegar. Stir to combine. Serve with kalamata olives sprinkled on top. This dish would also be great as a cold pasta salad. Michael and I have a busy week coming up! Our yard is going in, our grill is arriving and... we may or may not be getting a PUPPY!!! Of course, I'll blog about it if it happens, so all my loyal readers (mom and dad) will know what's up. Also- my mom is coming to visit! I hope everyone has a good week.